Have you seen the new 2019 membership badge? 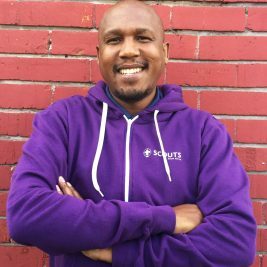 Did you recognize the Wood Badge symbolism? 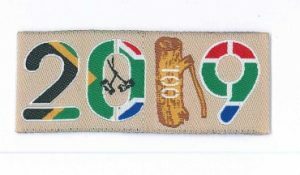 2019 marks 100 years of Wood Badge training! Since the establishment of the Scouting Movement in 1907, training has always been one of the core elements in achieving the Scouting Mission. The first Wood Badge training took place at Gilwell Park in England in 1919 and was run by Sir Robert Baden-Powell. At the completion of the course, all participants asked if they could have some token to indicate that they had been trained. At first Baden-Powell improvised by taking two little beads from a string of such beads he had; he threaded them on a bootlace, and hung them around the neck of each Scouter. Ever since, each Scouter who has successfully completed the advanced training course, receives two similar beads on a leather thong. Known as the Wood Badge beads, they are proudly worn by Scouters to indicate that they are continuing in a tradition handed down from Baden-Powell. The ‘Axe and Log’ logo refers back to the Camp Chief, Francis Gidney, of Gilwell Park in England in 1920. He needed something to distinguish between Gilwell Park – the outdoor activity centre – and that of the Scouting administrative headquarters. He felt that the ‘Axe and Log’ represented the farm where Gilwell was situated full of many open spaces and trees. This logo came to be strongly associated with Wood Badge leader training and is still used on certificates, flags, and other programme-related items. Lastly, the axe in the wood reminds those who have completed their Wood Badge that they have committed themselves to be an example of service and loyalty.